The massage therapy profession is about 20 years behind WA State massage therapists who have been able to become contracted providers with health insurance companies since about 1993 when the insurance commissioner at the time, Deborah Senn, created and fought for the Every Category Law. We had 20 years of higher allowable fees and higher benefits for massage therapy sessions and now are having many challenges. No one has been at the table with these insurance companies talking to them and showing them what massage can really do. Massage therapy could be saving them money if they only knew it. Other states have health insurance plans that are covering massage even though there are no laws in place to make it so and again no one is standing up for us and representing us at the table. The professional associations have said that they do not want to help implement the Affordable Care Act Section 2706 which would help us get our foot in the door. (See: AMTA: Supporting Massage Therapists for the Affordable Care Act (or Not?) by Laura Allen) Their reason for lack of involvement is that they say the majority (51%) of their members do not want this. What about the other 49%? There are many massage therapists who do want it though. Getting massage covered by insurance is a dual edged sword. On one hand, it will open up care to many who can not afford it. It will make massage therapy an important part of essential health care. On the other hand, it is difficult to deal with insurance companies as it requires more time and energy with dwindling pay and benefits. Could this be changed if someone, some association was standing up for the massage profession? 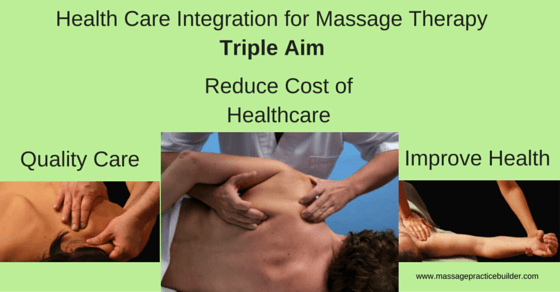 Little by little, insurance and doctors are realizing just how important massage therapy is in achieving the Triple Aim, reducing Opiod Use and managing the high cost of musculoskeletal injuries and conditions. I personally would like to see massage therapy be the first line of treatment for pain syndromes and injuries.